An exhibition of glass art currently showing at Glass Plus Gallery in South Melbourne, featuring the work of four young glass artists who have each won the annual Glass Plus award for outstanding graduating glass artists. Mariella McKinley won the award in 2007, Annabel Kilpatrick in 2008, Lisa Krivitsky in 2009 and Samantha Cuffe in 2010. Opening last week, the exhibition runs until the 20th of August. For a discipline that does not enjoy as widespread practice or patronage as painting or sculpture, it is difficult to consider glass art without comparing it to these more mainstream endeavours. Emerging offers some valuable insight into two contrasting pursuits evident within glass art – those of narrative (painting) and representation (sculpture). The works of Kilpatrick and Krivitsky both demonstrate an interest in the former, utilising plates of glass carved to reveal pictographic scenes, in much the same way that a painter utilises a canvas. While Kilpatrick’s works in particular possess a nostalgia that is both engaging and beautiful, we find this approach has limited capacity to explore the nuanced and translucent properties of glass. Taking a decidedly more sculptural approach, the representational work of Cuffe and McKinley fully captured our attention. 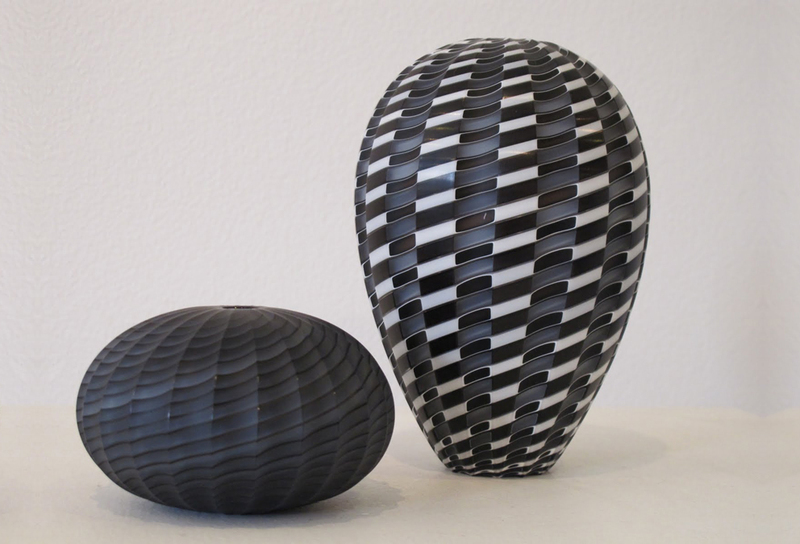 Rather than regard glass as a blank surface on which to imprint an image, both artists have fashioned small sculptural forms derived from explorations into simple representational ideas. McKinley uses a complex caning technique to evoke the fractured imagery of the kaleidoscope. Her works have an alluring delicacy with such intricate spiralling geometries that they appear naturally formed or possibly computer-modelled. As well as the kaleidoscope, there are clear references to sea urchins and even woven steel cables. 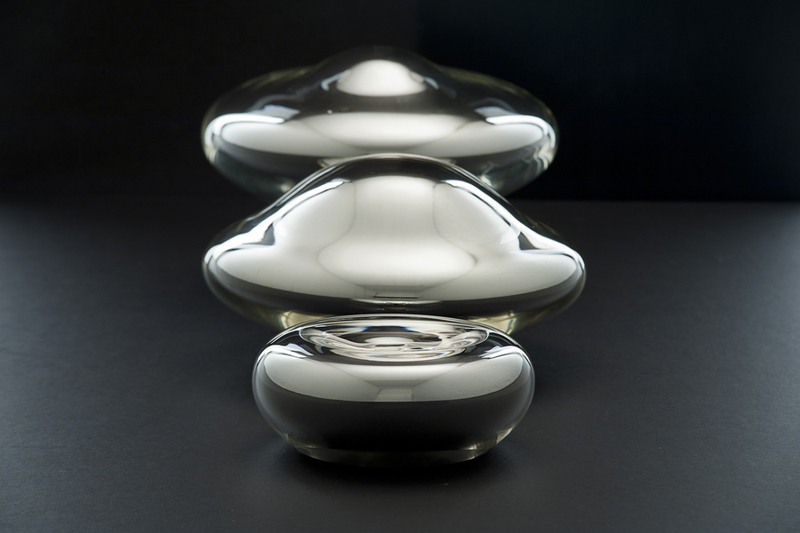 Cuffe’s works are grouped into a repetitive collection of mirrored baubles, reflecting the viewer in an array of fascinating curvilinear shapes. The collection attempts to reveal the scission between “Our real selves and the reflections we perceive in the mirror… It plays with the subjectiveness of body image and allows its audience to question how they are seen within their environment”. Each piece is a precious object that appears at first glance to have perfectly formed mirror surfaces, but upon closer inspection reveals a satisfyingly handmade quality whose undulations and irregularities create unexpected delight in their grotesque distortions. Both McKinley and Cuffe are interested in the juxtaposition between precision and imperfection – an exploration well-suited to the unique qualities of glass. Starting from specific representational seeds that could just as easily have sprouted traditional sculptural works, their pieces in glass flower with many potential qualities. Thanks principally to the delightful relationship between form and translucent / reflective surface, they make many analogous suggestions that depend as much on the experiences of the viewer as they do on the finely crafted and beautifully detailed objects themselves.